While cybercriminals were once clamoring for your payment data, today they are much more interested in other types of information. And of course, it's all about the money. Stolen credit-card accounts available on the "deep Web" are selling for 22 cents per record. Netflix account information, on the other hand, averages 76 cents per account. But the real deal is Facebook. A cybercriminal with stolen Facebook account information averages $3.02 for each one he sells. Uber accounts are even more valuable, bringing in $3.78 per account! Change your passwords often, use strong ones and never use the same password more than once. If that's not realistic for you, use different passwords for your social and financial accounts. Mobile Apps Snoop On Your Location Way More Than You Think! Lots of people have "no idea," that their location is being tracked! Nothing is truly free, including mobile apps. Be aware of the personal information you give mobile app providers. Many free apps sell your information to a wide range of companies, some of which may have malicious intents. Studies have shown most apps do not have many, or even any, security controls built in. Check privacygrade.org to see if the app you want respects your privacy and has security built in. Be cautious with new "smart" devices. A wide range of new and unique gadgets -- from socks to smart cars -- connects you directly to other entities (and even to the Internet) to automatically share information about your activities, location and personal characteristics. Before using such devices, make sure you know which data they are collecting, how it will be used and with whom it will be shared. Only share personal information with trusted sources. Be extra careful not to share sensitive personal information, such as social security numbers, credit card numbers and driver's license numbers. Don't do business with an entity that does not have a posted privacy notice. Be Mindful - Does Mobile Apps Respect Your Privacy? Not surprisingly, a new report has found mobile apps are failing to provide users with basic privacy protections. You should absolutely understand what you are being asked to give up to take advantage of the app. Is it worth it? The Facebook used by billions is sharing its users' online behavior in ways it previously said we could opt out of. A Handy Way to Foil ATM Skimmer Scams - Thieves continue to place hidden cameras at ATMs to surreptitiously record customers entering their PINs. This previously reported way to stop from being a victim still works against the hidden cameras. Encrypt files in storage ("files at rest"). Encrypt files sent to and obtained from the site ("files in motion"). Look for a third-party security and privacy audit or some other validation that the site truly is secure. Do an online search to see if the service has been breached in the past year or two. Make sure that you can completely remove all files from the site when you stop using it. A previous spot report released by Cimation's ICS Threat Intelligence team provided a threat overview of Havex, the malware family being used for targeted attacks against specific industry sectors. What many reports fail to mention is that this malware code has been altered to specifically target ICS/SCADA systems. In this newly-released summary report, Cimation's ICS Threat Intelligence and Vulnerability Research Teams expose the operational-level impact and technical indicators of compromise from this attack. A detailed Havex threat summary and overview. How Havex infects and affects your systems. Technical analysis and breakdown of the Havex threat. Tactical mitigation strategies for prevention, detection and removal of this threat. What Becomes Of Your Online Accounts After You Die? Have you ever wondered what becomes of your online accounts after you die? The Washington Post recently looked into the question, and reports that "The immortality of one's digital accounts is one of the more morbid philosophical wrinkles of modern life." Here are a few of the take-aways from the article: Family who want to access these accounts often can't. Digital asset laws vary greatly by state and country. This Facecrooks article discusses a very important topic - "Securing your Facebook profile" - and gives step-by-step instructions for enabling two-factor authentication. The idea is to keep out anyone attempting to access your profile from a device Facebook doesn't recognize. Astoundingly, two years ago at least 13 million U.S. Facebook users didn't use or weren't aware of the social network's privacy control settings. Based on various news reports covering Facebook privacy, it is anticipated that this number has not gotten smaller, but more likely has increased (perhaps by a significant amount now that there are more than a billion active mobile Facebook users). How many of these millions are within your employee, patient or customer communities? How does this impact you personally, or put your own information at risk? Remember, your privacy can be impacted simply by being associated with "friends" who don't activate their privacy control settings. WARNING! Your Flash Player may be out of date. Few days ago, I started to receive a pop-message "WARNING! Your Flash Player may be out of date". Please update to Continue., when I was trying to access websites like Facebook, YouTube, Google, etc. If you're receiving a similar message then continue to read but make sure you don't click on anything nor try to update the flash player from the pop-window. You may check your current version of the "Adobe Flash Player" by visiting "Adobe" official website. If you're using Google Chrome browser, it already includes Adobe Flash Player built-in. 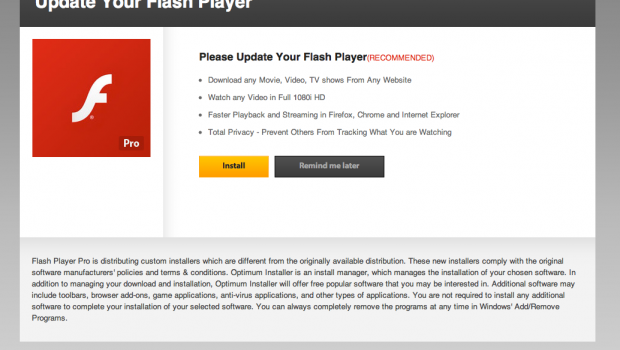 Google Chrome will automatically update when new versions of Flash Player are available. You will also notice that the same message is poping-up on all the devices which are connected to the same router (mobile phones, laptops etc.). Now even the dumbest person should know it is not coming from computer but from the network which means your router is infected. It's commonly happening with Linksys, Asus and few other manufacturers. Reset your router (by holding down the reset button under the router for 6 seconds). Note after restart all your ISP settings will be lost. Configure your router again with the ISP settings (username and password also required). Clear your browsers cache and pop-up message will not appear again. Refer here for some basic tips on hardening your router to avoid such things happening again.